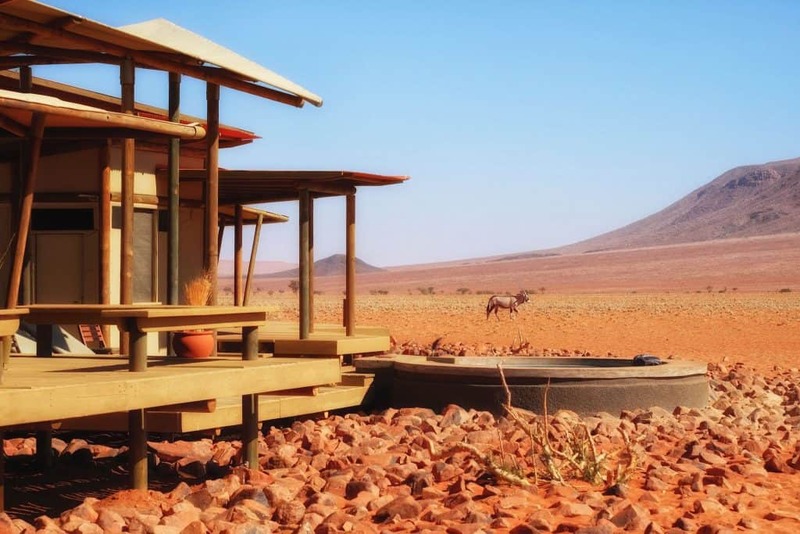 If there is one lodge that is THE lodge in Namibia it is Wolwedans. 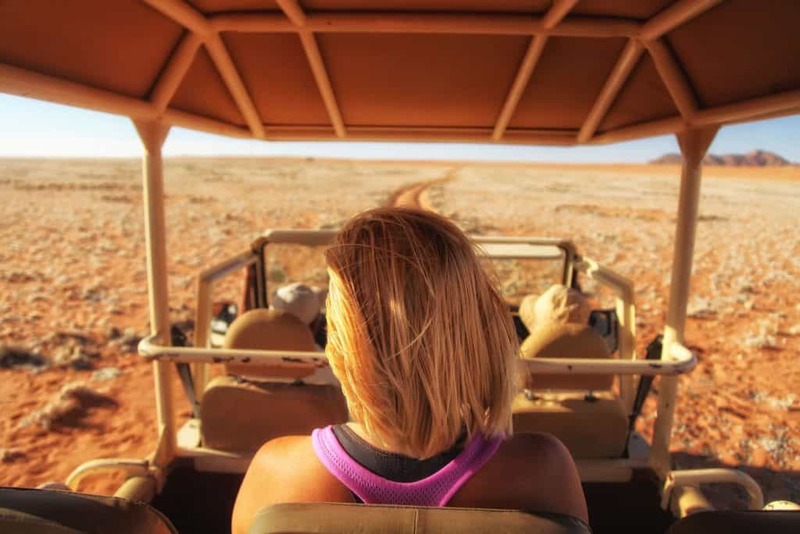 There is arguably no better way to experience the Namibian desert. 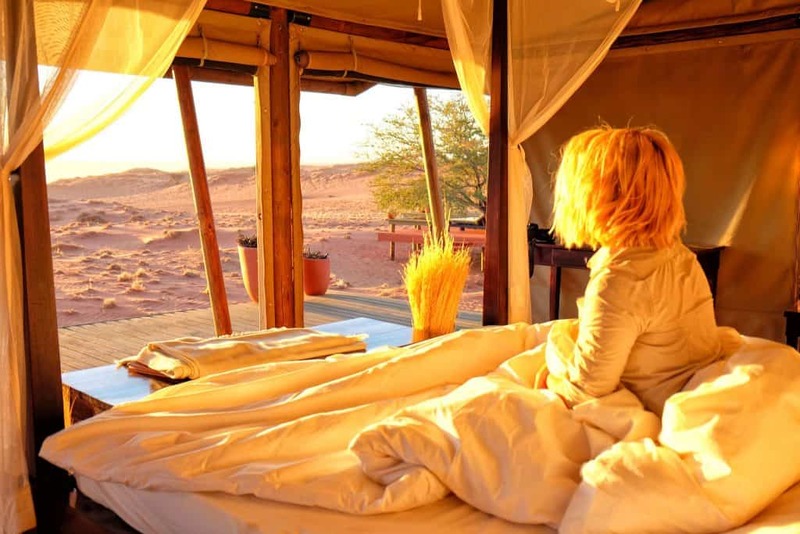 The Wolwedans Collection consists of four camps Wolwedans Dunes Lodge, Boulders Camp, Private Camp, and Dunes Camp. 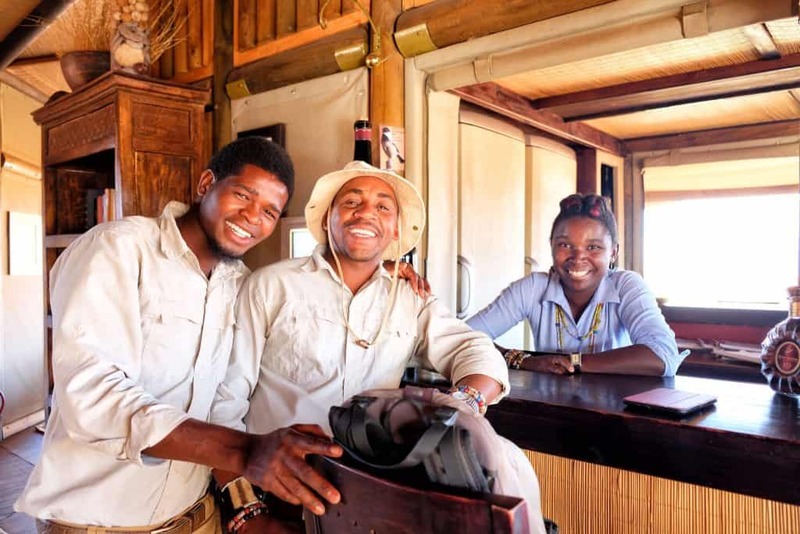 The Wolwedans operation is a contender for the best eco-lodge operation in Africa and arguably the best in Namibia. At the core of a lodge in Africa is the environment, it is what draws guests. And how a lodge treats views their environment speaks loudly about the passion that will be experienced by those fortunate enough to call themselves guests. 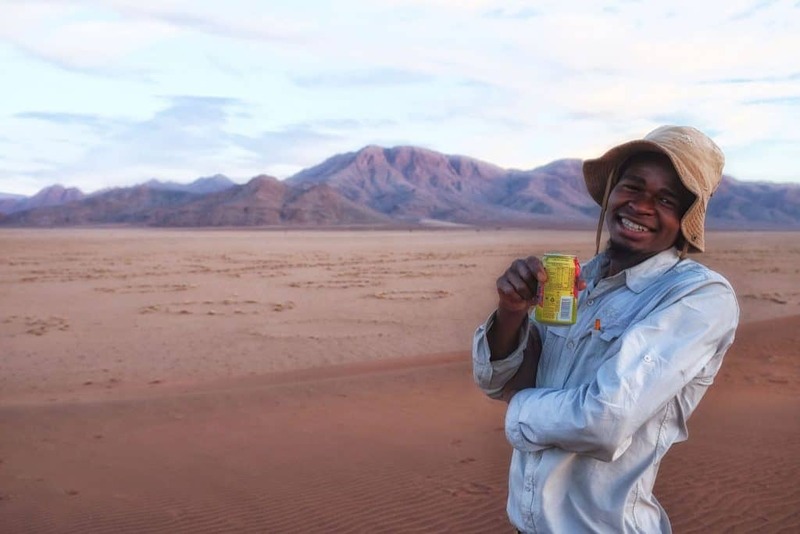 What’s your idea of Namibia? If you have any idea, it is likely one of wonder. While images of towering sand dunes, ancient rock formations, wild tribes, desert animals, sand storms, and mysterious circles swirl around your head. All of which are striking elements of Namibia. However, one of the most striking elements of Namibia is not the scorching hot temperatures in the summer, but the serenity. In the desert at night, there is simply the wandering soul and the night sky. For us, we found solitude in Namibia in almost every corner. 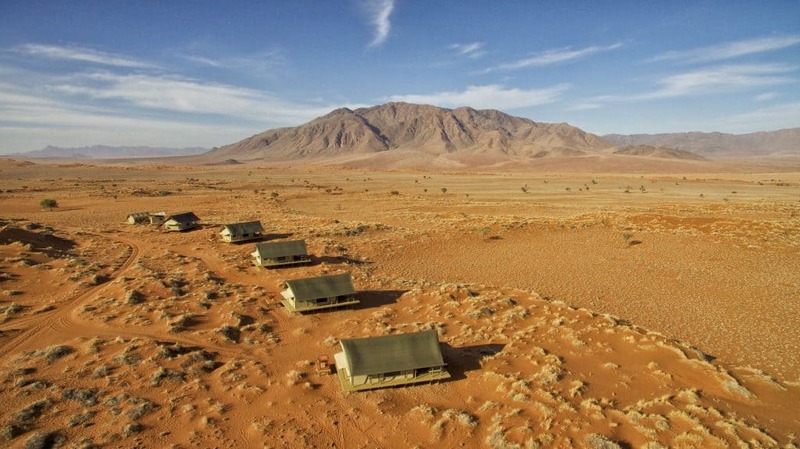 Wolwedans is a collection of camps/lodges in the middle of the desert. It took us a few hours to get there with Charlie, on the unpaved and corrugated roads that make up Namibia. 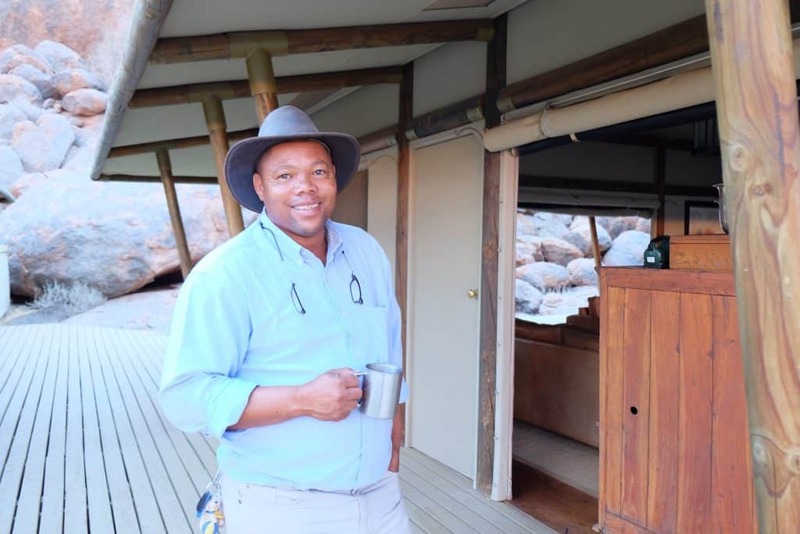 The founding partner of the NamibRand Nature Reserve a 200,000-hectare non-profit private nature reserve in southwest Namibia. 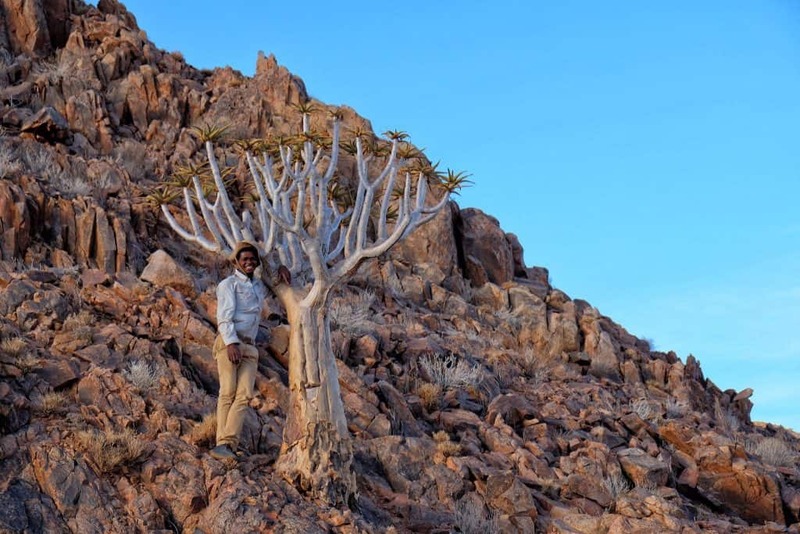 The focus of which is the preservation and restoration of the Namibian land to its natural state. We talk a lot about eco friendly products and businesses and Wolwedans is an exceptional example. The lodge company is very close to self-sustaining, which is amazing given their location in such a secluded part of the world. The reception area is where most guests will check in and leave their car for the duration of their stay. Except this reception is much more than the typical hotel reception area. It’s the heart and soul of the entire Wolwedans operation. “Base camp,” is where the staff members reside, where water is treated, where waste is managed, where vegetables are grown, and where all the magic happens. We were given a comprehensive tour around base camp to see the behind the scenes operations for ourselves, and it was remarkable to see the amount of care that goes into making this whole operation complete. From the bed frame woodwork, to tent canvas repairs, to in laundry facilities and auto repairs this place runs like it’s own little city. 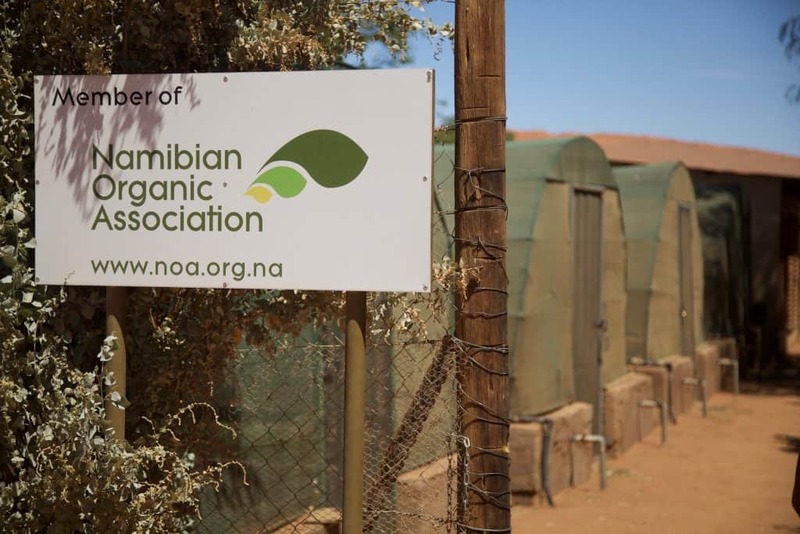 All produce is grown in greenhouses set up at base camp, with only meat products coming in from Windhoek. We were pleased to find out that Wolwedans scored 5 flowers for Eco Awards Namibia, promoting recycling, reusing, and reducing. I could go on and on about their sustainability objectives in Africa, but I want to take you to the beautiful lodges first. 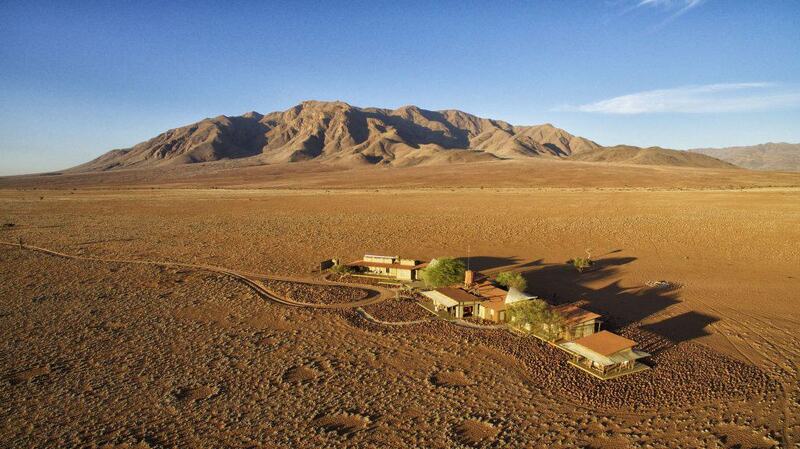 We were told that sometimes the Wolwedans Dunes Lodge is seen as the least popular option at Wolwedans, but I cannot possibly see why. The lodge is situated right at the top of a major sand dune and offers incredible views. We were greeted by the lodge manager, Selma, at arrival. She introduced herself to us with her birth name, from the Nama “click” language that I don’t think I could ever properly pronounce. So we settled on the name “Terrible Selma,” until we were to depart. 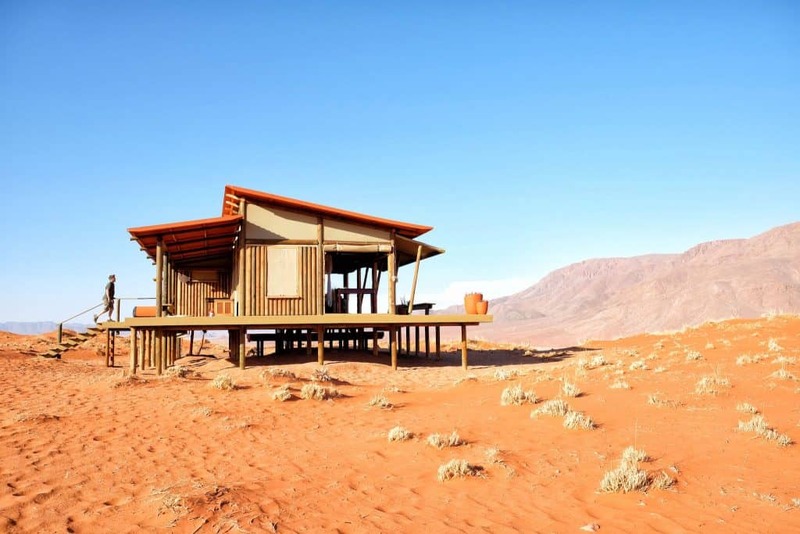 Wolwedans Dunes Lodge features ten chalets mostly constructed out of wood instead of canvas tents. Each room opens up to the east, offering incredible views of the sunrise every morning. We slept with the canvas tents rolled up and could gaze at the stars all night. We felt at one with nature while still having an extremely comfortable sleep. Wolwedans Dunes Lodge has a massive pool attached to the pharmacy (or the “bar”) and continues to spill into one grand lobby area. 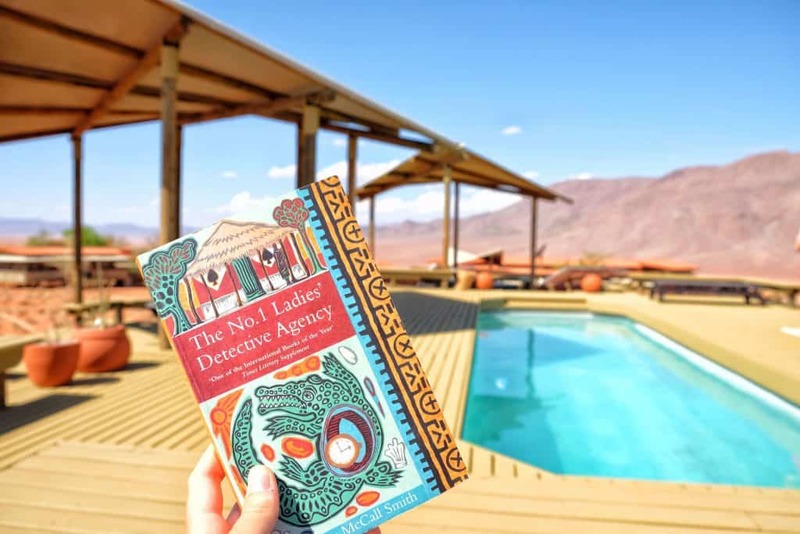 This is where Cameron and I spent most of our day – basking in the intense Namibian sun surrounded by cool water and a good book. 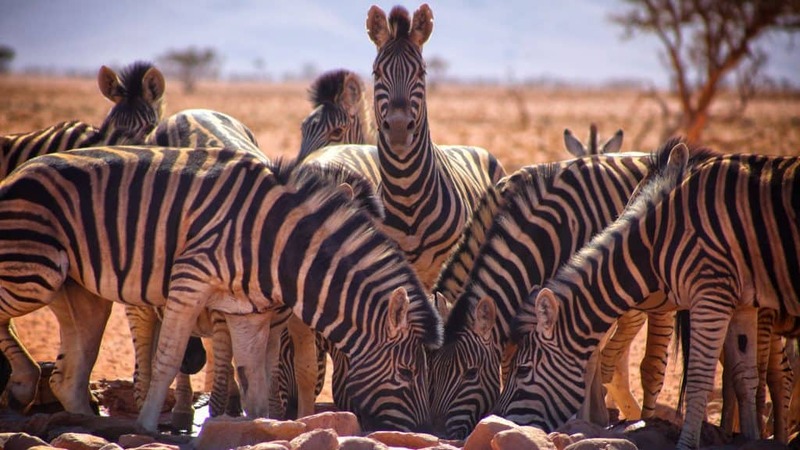 Dinner time becomes a communal gathering at Wolwedans Dunes Lodge. 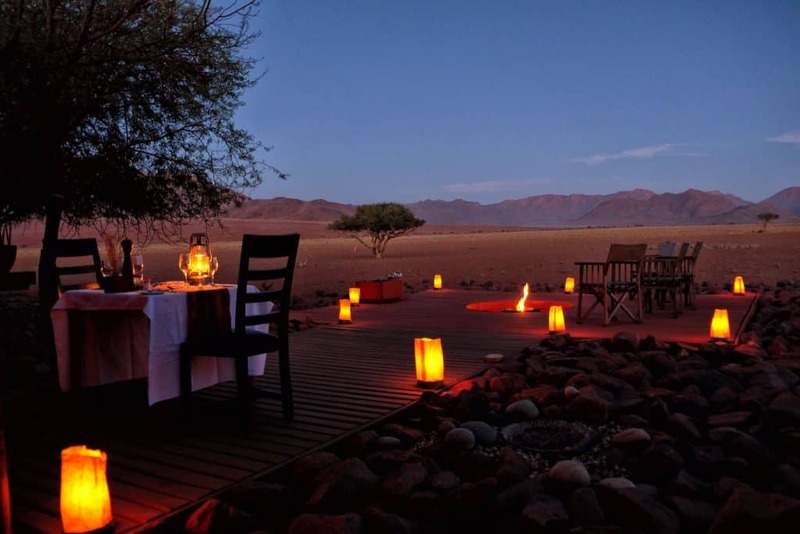 Guests can all sit together and get to know one another over a seven course Wolwedans meal. Meals start with a small appetizer, and then grow and grow into a magnificent and decadent main dish of fish or meat. 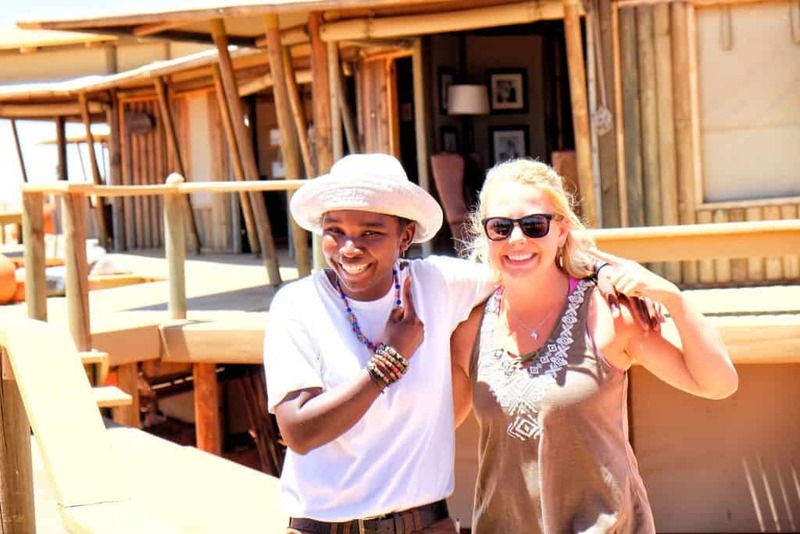 I am a pretty social person, so I thoroughly enjoyed that Wolwedans encourages guests to sit together at Dune Lodge – we even walked away with a few new friends here. Of course, separate tables are available for those who want a private experience. We were feeling like even better eco-friendly travelers after Wolwedans Dunes Lodge so we made our way onward. 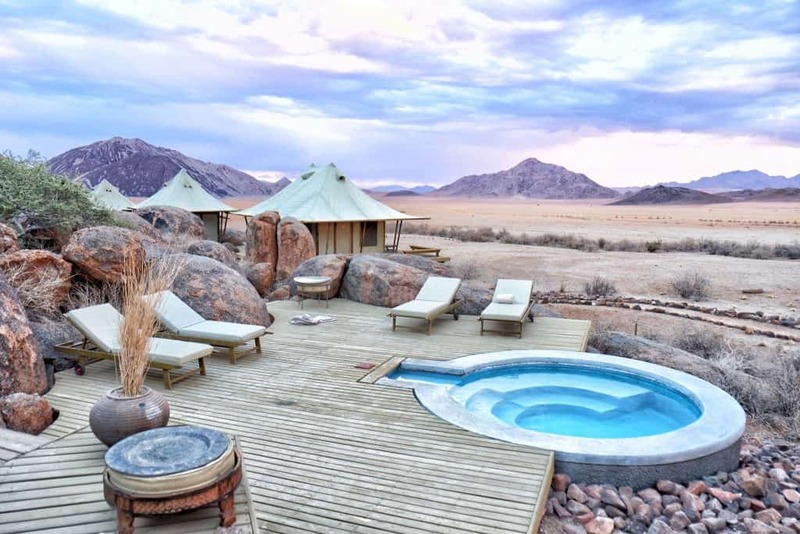 Wolwedans Boulders Camp is easily the most secluded, exclusive, and different style of camp in the collection. It’s about 45 kilometers from base camp and takes at least an hour on interesting dirt roads to get to. 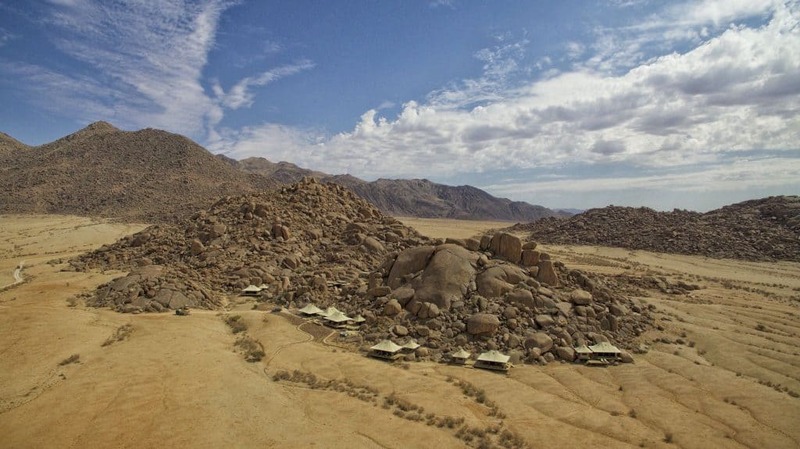 Boulders Safari Camp is built entirely into… a series boulders! 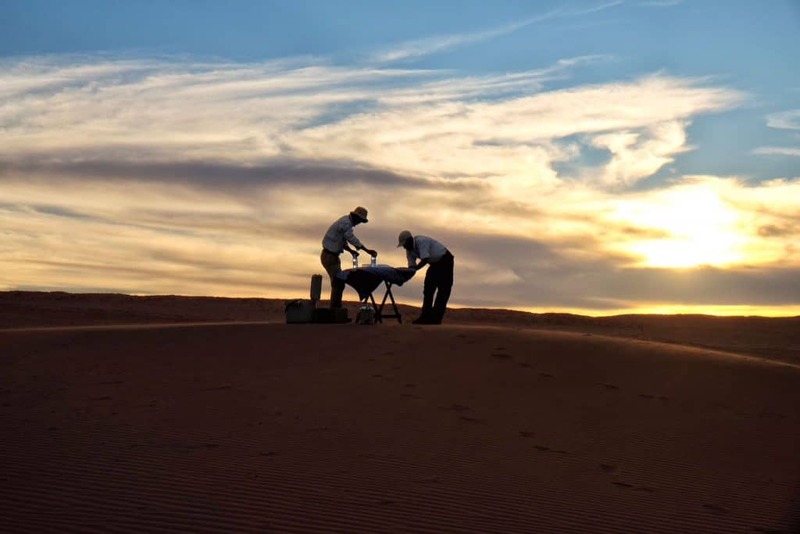 There are only four tents that can accommodate eight people, making it one of the most private lodges in the desert. The entire camp is run by the men of Namibia, or the “Boulders Boys” as they told us upon arrival. We settled into our comfortable tent and enjoyed a sundowner with the other guests around the camps boma. The Boulders Boys were going on a game drive in the morning as this area of Wolwedans is where a lot of the wildlife action happens. This is also the only area of Wolwedans where we saw a cheetah! He bolted in front our car so fast that unfortunately, we were unable to snap a photo. Wolwedans Dunes Camp is located at the top of a 250-meter high dune, with breathtaking views over the stunning mountains. The back porches of the tents at Dunes Camp are the perfect place to chill out and get lost in the desert air with a good book. There is a WiFi at the main lodge where coffee, tea, and cake is so that everyone can feel more at home with their stay. When the sun goes down the ladies’ light a fire and they encourage everyone to gather around and enjoy a sundowner together. Dinner here is also a communal affair and everyone can enjoy their seven-course meal within the company of the other lodge guests. 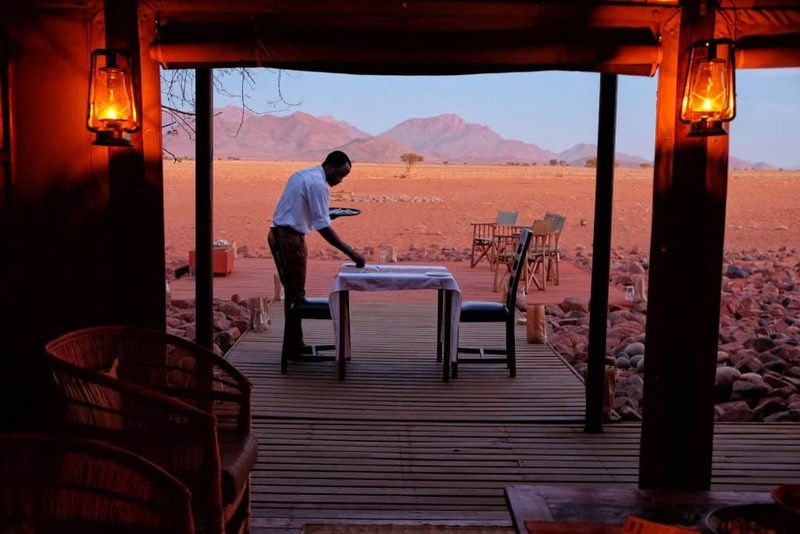 Although we loved our time at Dunes Lodge, Dunes Camp, and Boulders Camp I have to give special attention to our favorite of the collection – Wolwedans Private Camp. Private Camp is as one may expect – private. For obvious reasons we really enjoyed the privacy and seclusion at private camp, and so did Brangelina and other celebs when they were here! Yes, private camp is a bit “famous.” The whole area is about five times the size of our old New York City apartment, and it’s located smack dab in the middle of the freakin desert! There are three luxurious bedrooms here, a personal bar, kitchen, living room, and outside lounge bed. 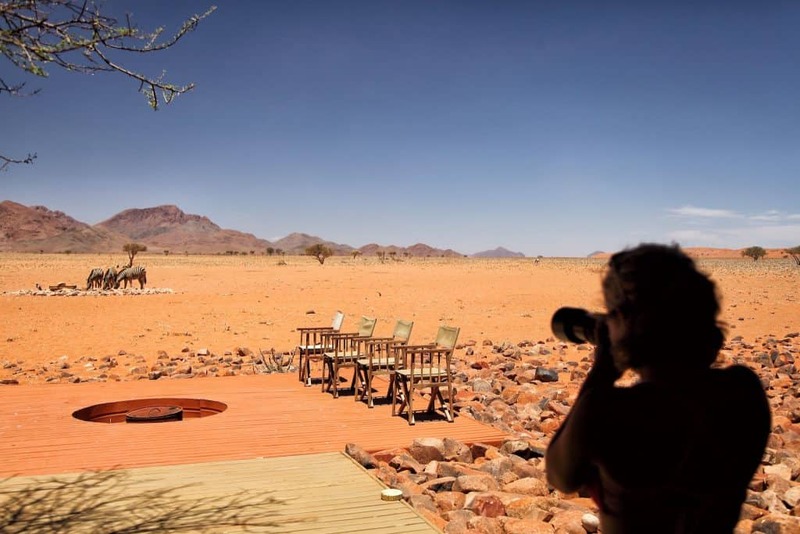 Private Camp also features a private swimming pool overlooking one of Wolwedans best watering holes. We enjoyed spending almost every waking second outside gushing over the life that the watering hole brought in. At almost all times there were either zebra, oryx, or springbok outside our doorstep. This made for the perfect opportunity for Cam and me to grab some amazing up-close wildlife shots. Just because we were completely secluded in the desert doesn’t mean we had to fend for ourselves either. Andrew, the lodge manager here was around for every meal and was accompanied by our own personal chef to prepare our breakfast, lunch, and dinner. We definitely didn’t leave Wolwedans any thinner. Dinner at private camp is a special affair as Andrew set up a romantic table for all guests to have dinner at under the stairs. Before dinner, Andrew and our chef exclaimed the courses in English and then in went into a very detailed version of dinner in their own language. The scene felt like something from Out of Africa, except I was Meryl Streep and Cameron was Robert Redford. If I could have a permanent home in the desert, Private Camp would be my first choice. Lounging around at every different lodge in the desert was more than relaxing, but I’m sure you are wondering what else we did. That’s where Bino and Buti came in! These two Bushman were our personal guides while we were at Wolwedans, and they were always there to show us around the huge reserve. We met Bino on our first day at Wolwedans. He asked us what we would like to do, and every day he was there to pick us up and drive us around while explaining the desert landscapes along the way. We met his uncle, Buti, on our second day at Wolwedans. Buti is a more a senior Bushman and really led us to delve deeper into the Bushman people and their hunter-gatherer lifestyle. We went on a few bushwalks with him, and let me tell you that this guy knows his stuff. He was easily able to spot snakes, spiders, chameleons, and even the smallest beetles that I could have never found. We were able to learn about his people and how they have adapted over time. At the end of each day, we enjoyed a sundowner with Bino and Buti. They would lead us to the most special places to catch the sunset and would tell us stories of their villages back home. We love learning about new and different cultures, so being able to talk and learn from them was exceptionally rewarding. Trampling around the Namibian desert is nice, but it is so much more enjoyable when you have local people that are able to guide you. We decided not to take part in a hot air balloon ride or the scenic flight over the desert, but many people do! This is a fantastic way to see the best of Namibia and can all be arranged while you are sipping on gin and tonics by the desert pool. 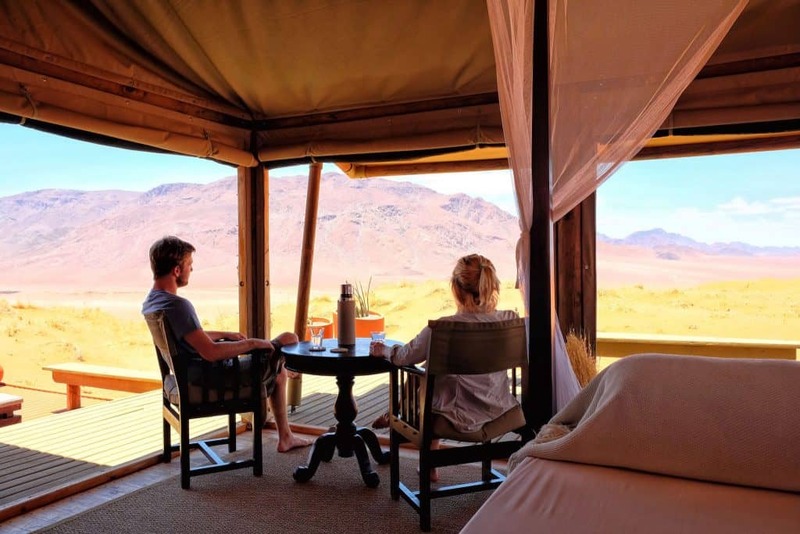 Why did we love our stay at Wolwedans? I’m sure after seeing some of these photos you may be wondering what a place like this costs? 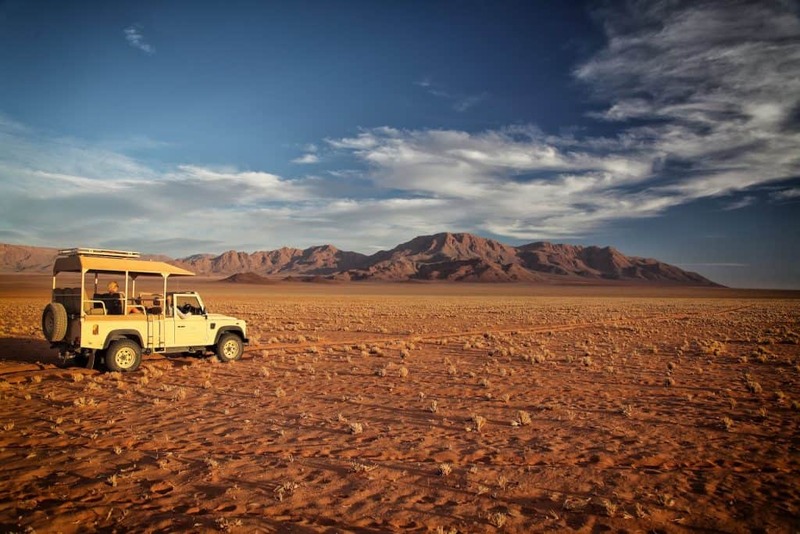 I have to admit that Wolwedans is far from a budget destination, and everyone traveling there knows that. However expensive it may be, here is why I’m okay with the costs and why we absolutely loved it. Being a sustainable eco-lodge isn’t a cheap venture. 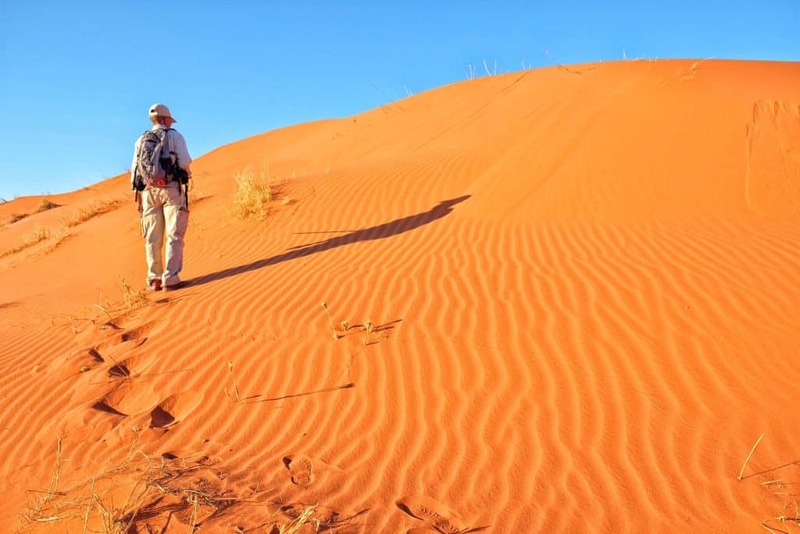 There is going to be some setup costs to keep the NamibRand Nature Reserve so pristine. 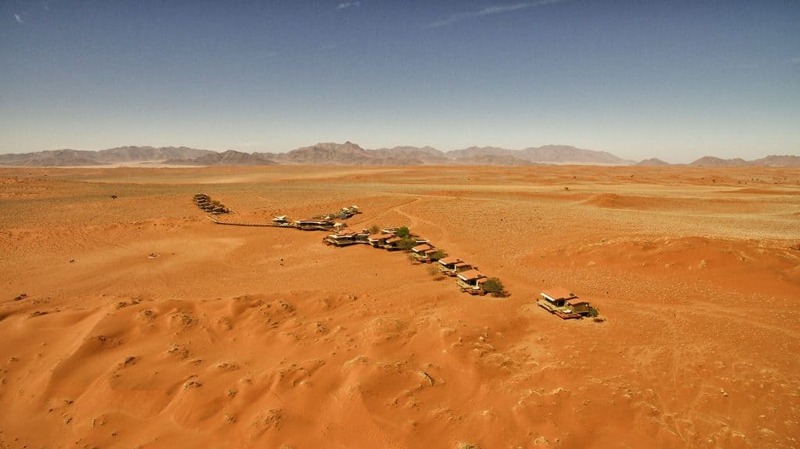 The Wolwedans team have taken years to build up the base camp to what it is today. The solar power, the water treatment, the plant nursery, and everything else has taken time and money to build. It feels good to stay at a place that is so committed to the fair treatment of the earth and its beauty. 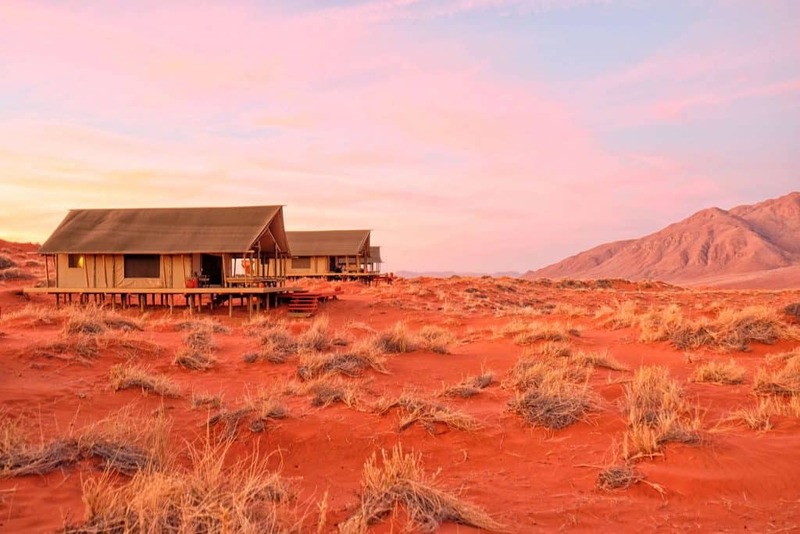 Every lodge is constructed in an eco-friendly manner, and every piece of Wolwedans can be removed easily so that one could never even tell there was a lodge in the desert to begin with. Namibia is also an extremely dry country and there has been a drought there for the past four years. Wolwedans has therefore intervened and set up watering holes every 10 km so that the desert wildlife doesn’t completely die off. 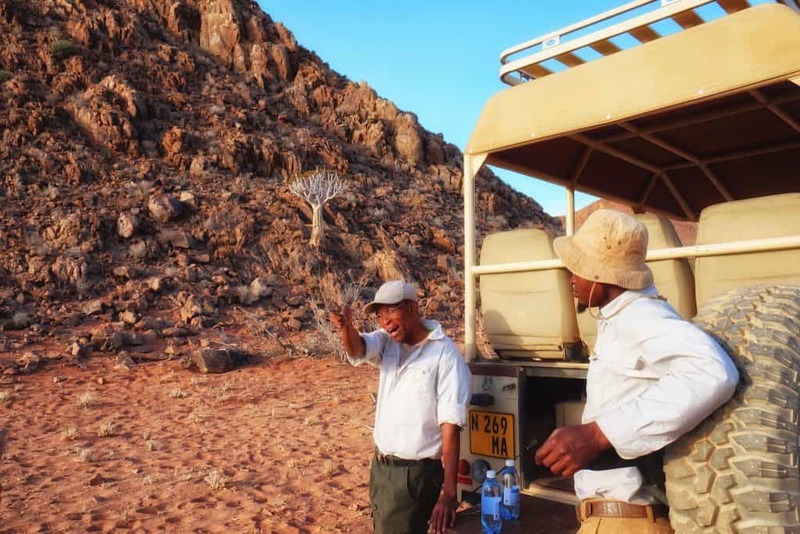 There are just about 80 staff members working for Wolwedans, and every single one of them played a special role in the whole operation. The staff here are well trained and many go to hospitality or tourism school in Namibia. 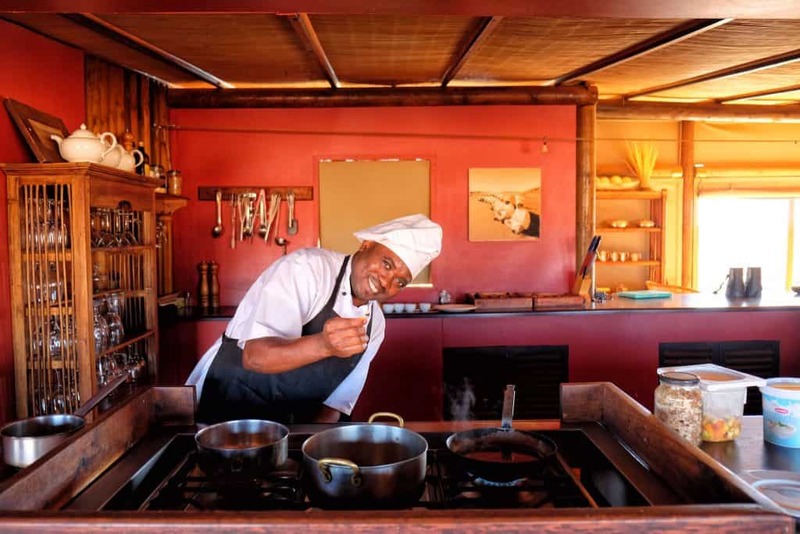 Even better, there is a school at Wolwedans teaching locals how to work in hospitality. Many of these students end up working for Wolwedans or other lodges across the country. We also loved that we were given a personal guide for our time at Wolwedans, a bushman from the Caprivi Strip. To sweeten the deal every night a staff member sings the dinner menu in their local language. The staff were incredibly welcoming and help create a wonderful atmosphere. The food here is top notch African food. You won’t leave breakfast, lunch, or dinner feeling hungry or unhealthy for that matter! 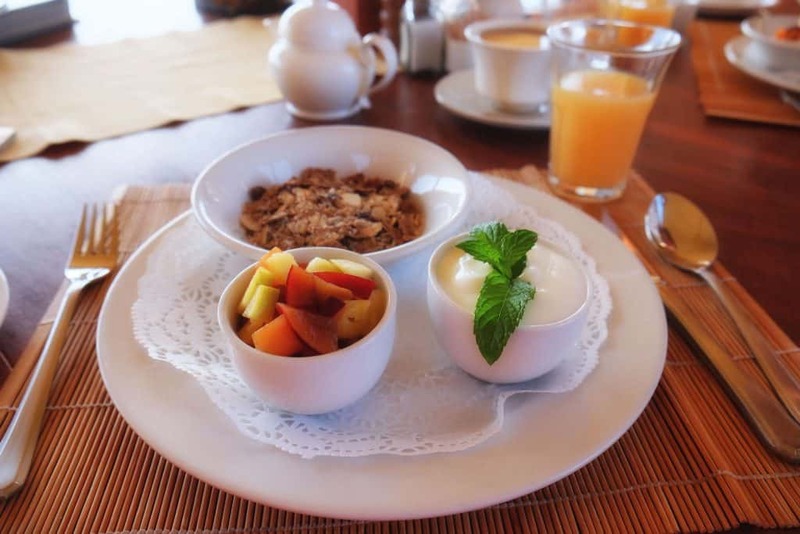 Breakfast usually kicks off with a choice of yogurt, fruit, eggs, or meat and cheese. Lunch is always some form of salad with ingredients grown right from base camp. Dinner is a seven-course extravaganza that will make you feel good about walking back to your tent in the thick sand. From the desert, to the lodges, to the morning views – everything is just so darn beautiful and dream worthy. 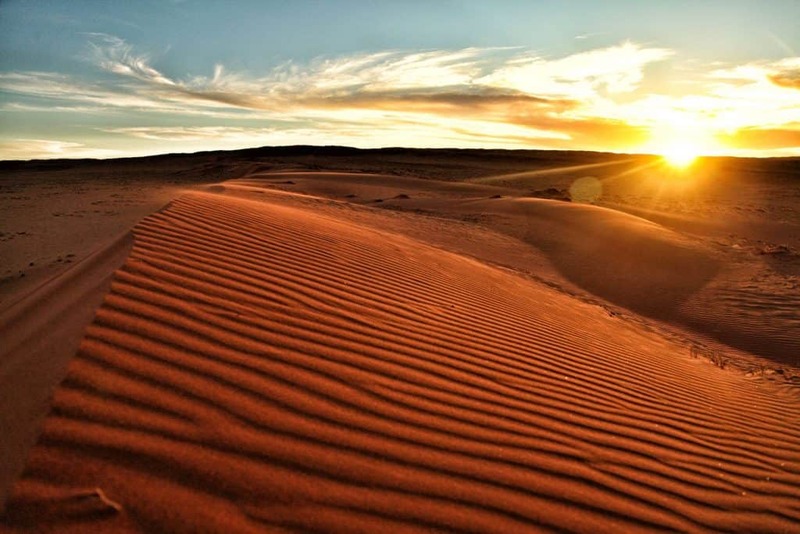 I know that nature is free, but waking up to the sun rising over the red dunes (while still in a comfy bed) is something that will truly take your breath away. I just have to wonder if you’re ready to get to Namibia and stay at Wolwedans yet? People are able to self-drive to Wolwedans with their own vehicle. A 4×4 is not necessary but recommended. Once at reception, the lodge staff will take it from there and all worries can be left in the car! Wolwedans also has its own runway and flying in is a popular option. 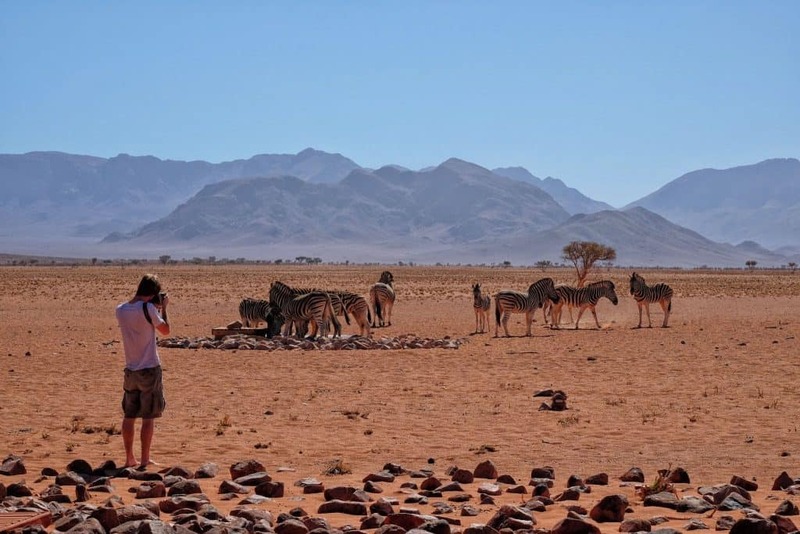 Wolwedans is located about 2 hours away from Sossusvlei and 400 km from Windhoek. We decided to take a different route and drove in from the Kalahari (Mariental ) which took us about 4.5 hours. Check here for exact directions. 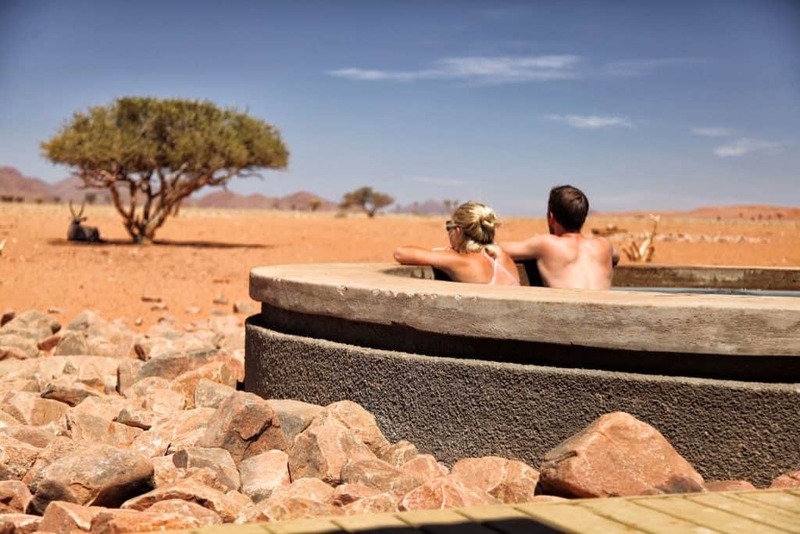 Wolwedans is not a budget destination, it is a truly special place in the heart of the desert. Rates start at $5850 Namibian dollars per person per night. A large chunk of the rate paid goes towards conservation up keep. We consider the payment to go towards a good cause by directly helping NamibRand Reserve and the beautiful Namibian people. Wolwedans is open all year round. High season in Namibia is April to October, with rains and summer heat setting arriving in November. However, we visited the lodge mid-November and had fantastic weather the whole time.